Already a premium subscriber? Register for a live training webinar today! Get how-to help and step-by-step instructions for specific features in Help. Ask questions, get answers, and join our large community of Asana experts. 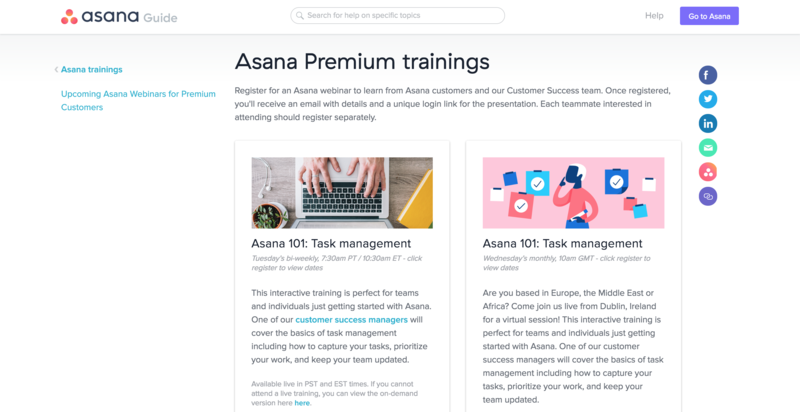 Learn how to use Asana through trainings, webinars, and interactive courses hosted by Asana’s Customer Success team. Learn how to onboard your team and use Asana to its full potential with quick and easy tips. 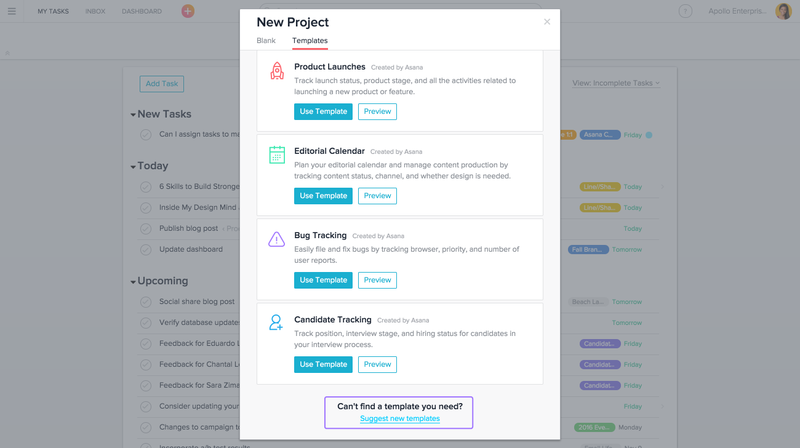 Learn how other teams like yours use Asana and how to build out projects specific to your team. How do I export, copy, print, or template a project? 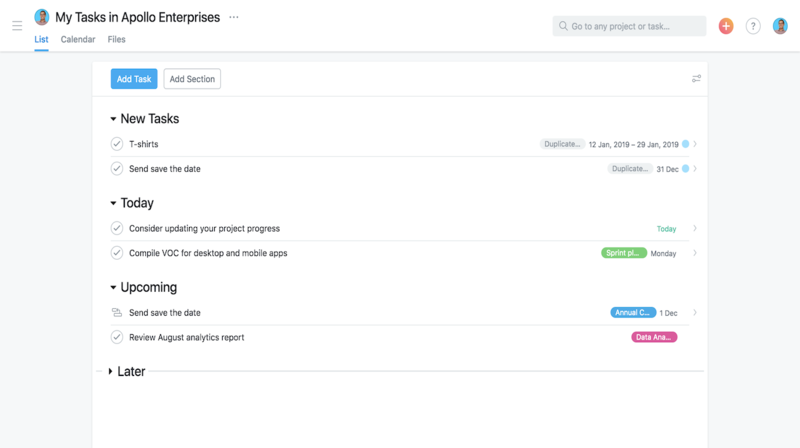 There are many available actions you can take on your projects in Asana, many of which are found in the Project header menu. How do I use a template to create a new project? From the project creation dialog, navigate to the Templates tab to find a list of templates you can use to create your new project. Tasks are the basic unit of action in Asana. You can take various actions on a task, all of which can be done from the right pane. How do I hide tasks assigned to me from template projects in My Tasks list? 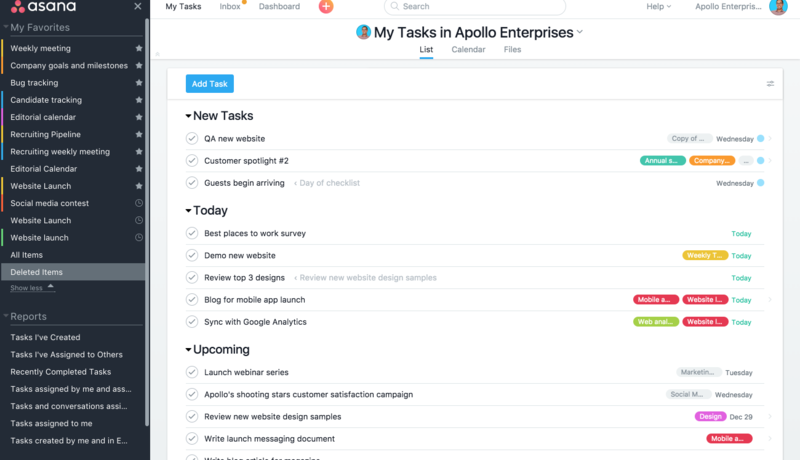 Your My Tasks will display all tasks that are assigned to you, regardless if that task is from a regular project or a template project. 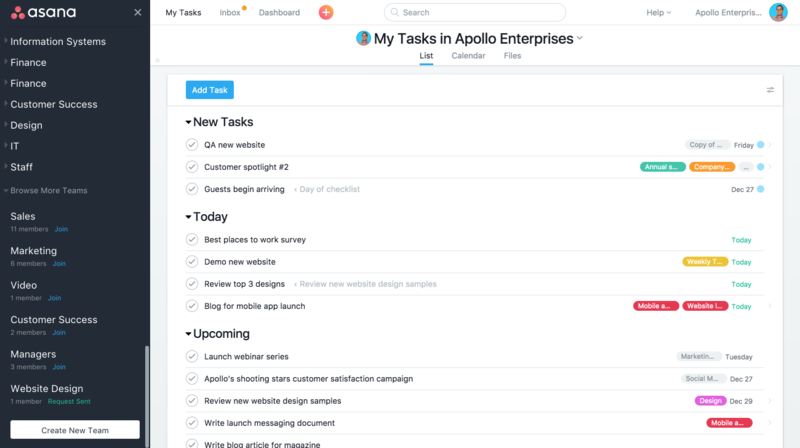 However, you can move these tasks into the Later priority in your My Tasks so that you have the option to collapse that portion of your My tasks list. How do I search for tasks, projects, and conversations? The search bar can be found in the top bar of Asana. To run a basic search, type the name or title of any object in the search bar. Select Advanced Search to specify more detailed criteria. How do I access Profile Settings? Access your profile settings to adjust your name, photo, email settings, or Hack features. 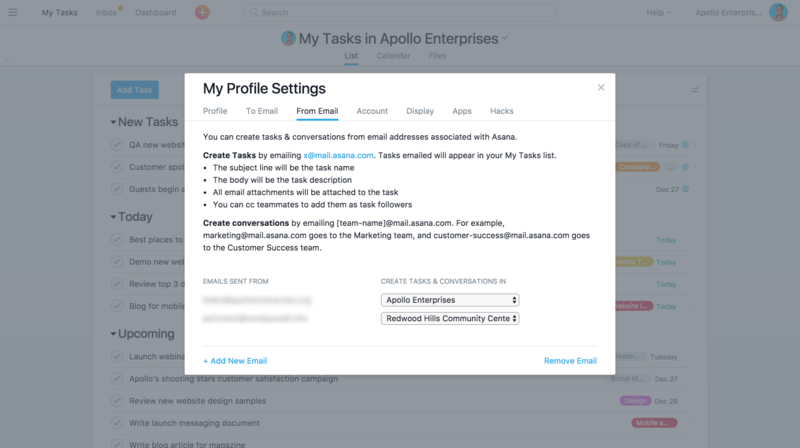 In Asana, you can have multiple email addresses associated to one account. To do so, go to your Profile Settings and navigate to the From Email tab. How do I merge my two accounts together? If you have two separate accounts, consider merging them together. To do so, go to your Profile Settings and navigate to the To Email tab. Rest assured, the Workspaces and Organizations you belong to will remain separate entities and private from one another after the merge. The only difference is that you’ll be able to access all of your Workspaces and Organizations without having to log out of one account and back into another. How do I enable or disable Hack features? Hacks allow you to try out experimental features that may or may not stick around. You can enable or disable any of these Hacks from your Profile Settings. Should I use a Workspace or an Organization? Use a Workspace if working alone or in a small team, or an Organization if you’re in a company and need access to multiple Teams. Teams are only available in Organizations. If you’re already in an Organization, scroll to the bottom of the sidebar and click Create New Team. If you do not see this option, that means you are in a Workspace rather than an Organization. 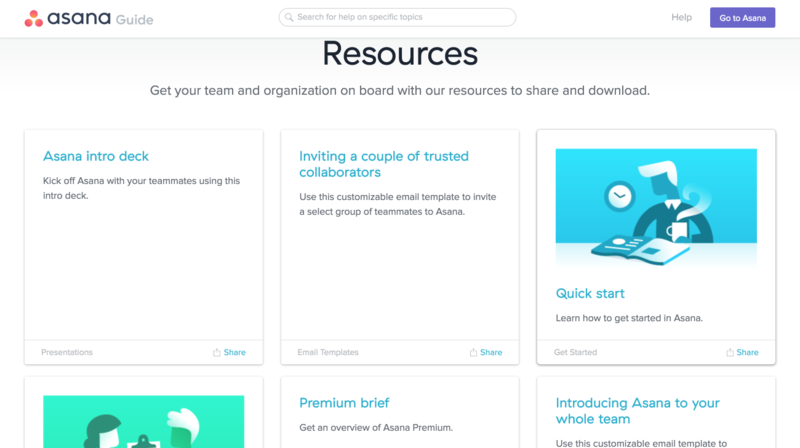 Organizations are shared spaces you use to collaborate with your colleagues in Asana. 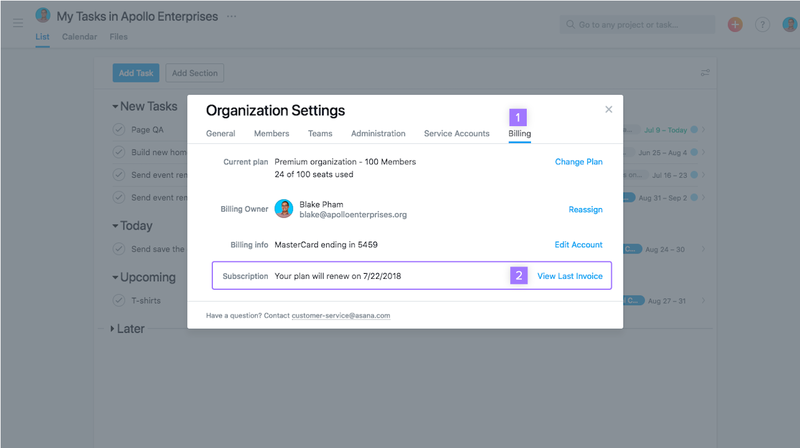 If you sign up for Asana with a work (or custom) email address, we will automatically create an Organization based on that email domain (or add you to an existing Organization with that domain if one already exists). If you did not sign up with a custom email address, add one to your account and you can then convert your Workspace into an Organization. Deprovision people from your Organization to remove their access from your company’s projects and tasks. In premium Organizations, only administrators can remove people from the Organization. Who is the administrator of my Organization? 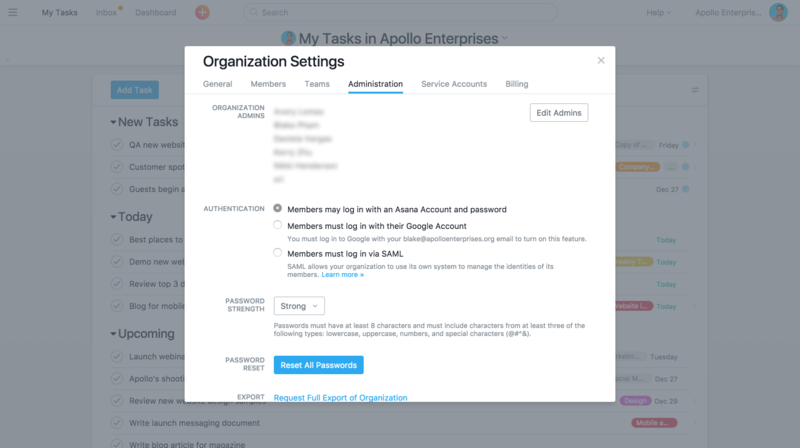 In the free version of Asana, all Members have equal control over the Workspace/Organization and there is no administrator role. The administrator role is only available in premium Organizations. If you are in a premium Organization, the identity of your administrator can be found in the Organization’s Settings. How to I move my projects from one Workspace or Organization to another? Start by exporting the project as a CSV from your source Workspace/Organization. Then, create a new project and import as CSV in your destination Workspace/Organization using the CSV file you just exported. 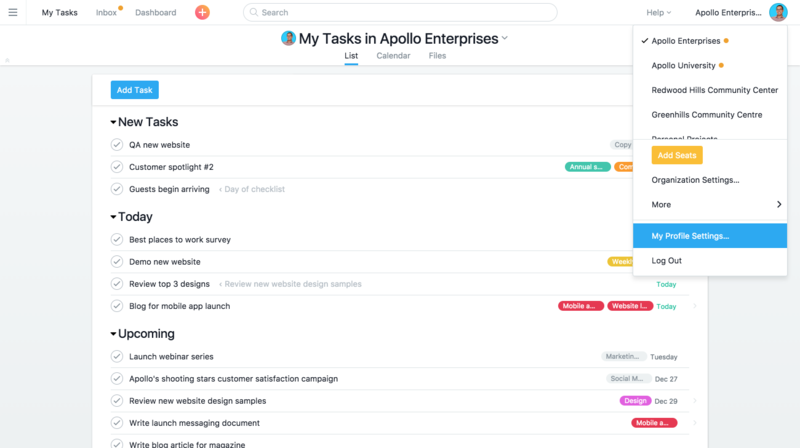 How do I create Asana tasks via email? 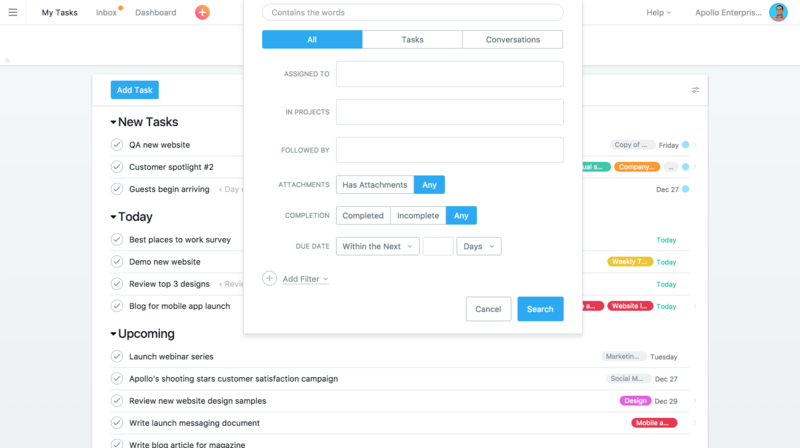 You can create tasks and conversations by sending emails to Asana. 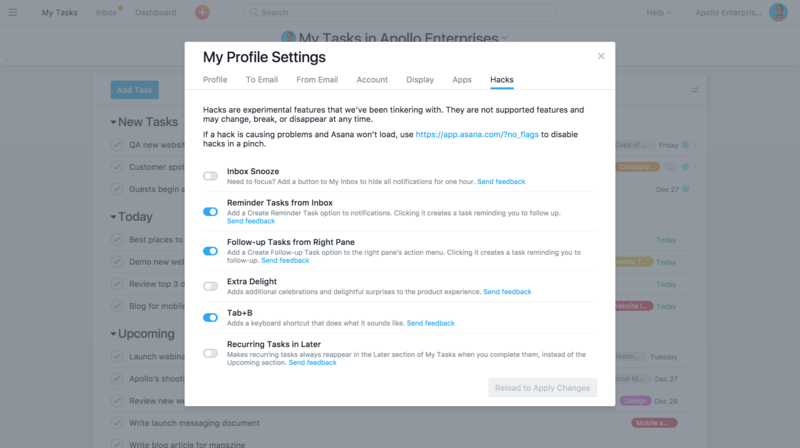 In addition to emailing x@mail.asana.com to create tasks in your My Tasks list, you can also send emails to create tasks directly in any Asana project or tag. 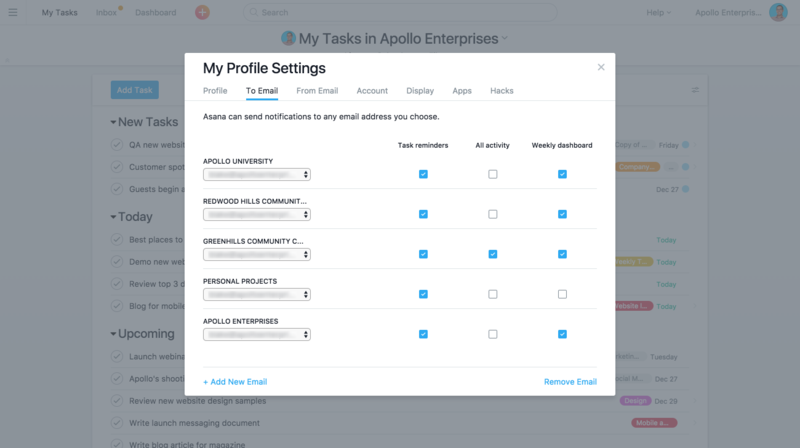 The From Email tab of your Profile Settings allow you to set which Workspace or Organization your tasks are created in. How do I adjust my email notification settings? 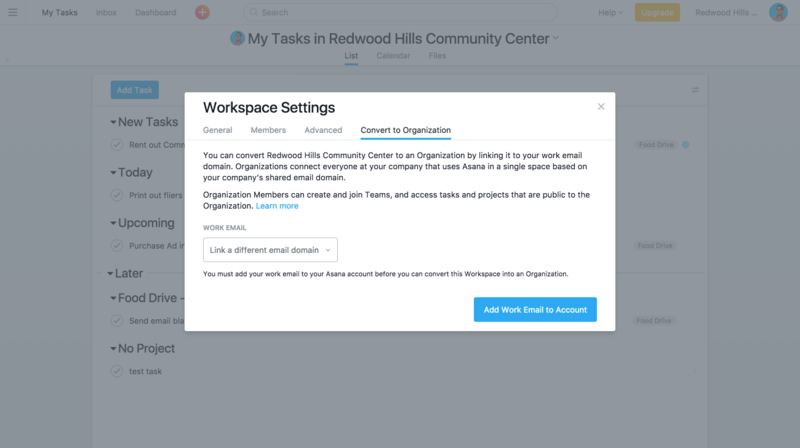 You can adjust your email notification settings for any of your Workspaces or Organizations via the To Email tab of your Profile Settings. Why am I still receiving email notifications from Asana even after disabling them all? There are certain email notifications that cannot be turned off, including notifications about deleted projects, deprovisioning someone from a Workspace/Organization, and deactivating your account as they all contain information that can help our UO team attempt a recovery of whatever that was deleted. 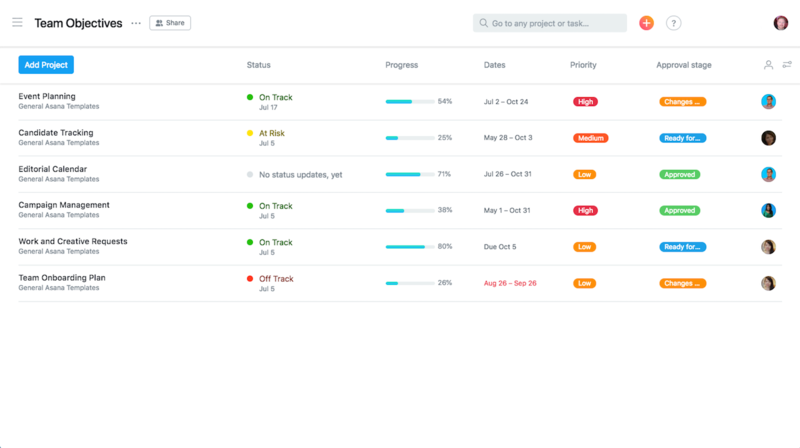 What features are available in the premium, business, & enterprise versions of Asana? 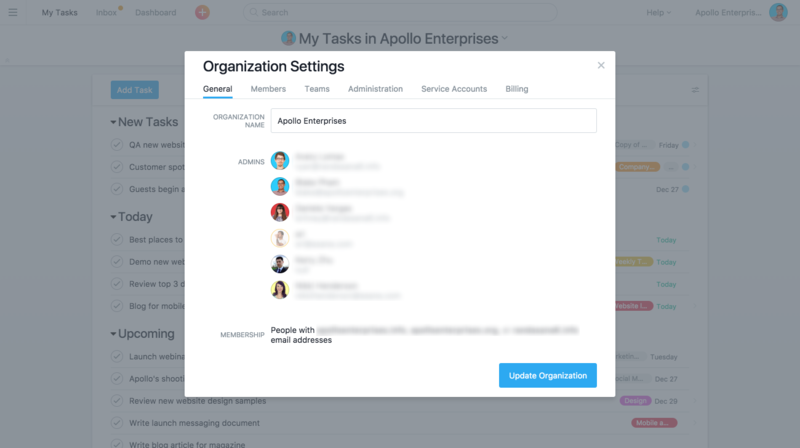 Check out the following page for a full list of features available in Asana’s premium & enterprise versions. How do I view my project as a timeline? Learn how to view and edit your projects in timeline view. How do I get started with Portfolios? Portfolios are the best way to keep track of all projects for a specific initiative or team in one place. Select Portfolios from the left pane to get started. How do I set up custom fields? Learn how to create, edit, and manage custom fields in your projects. How do I change my plan size, reassign billing owner, or update credit card? Click your profile photo in the top corner and select your Organizations Settings from the drop-down menu. Navigate to the Billing tab to update billing information. Where can I find a list of current integrations? 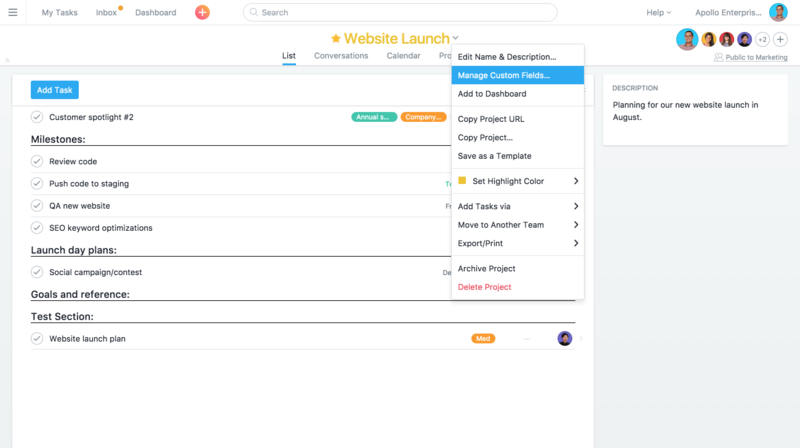 Asana works with all the tools your team is already using. See our current list of integrations on our Apps page. How do I submit my own integration? 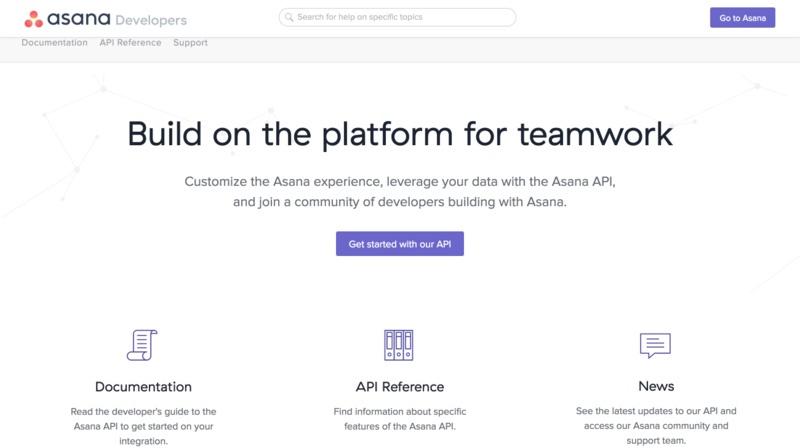 Did you build an Asana integration? Wed love to check it out! Please submit your integration here—and thanks! If you need help or additional information to get started, please check out our developer’s guide. 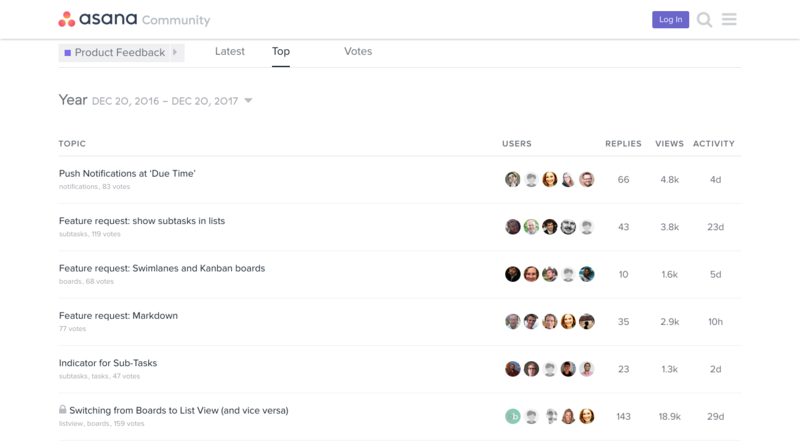 Join the Asana Forum to connect with other Asana developers. How do other teams set up their projects? 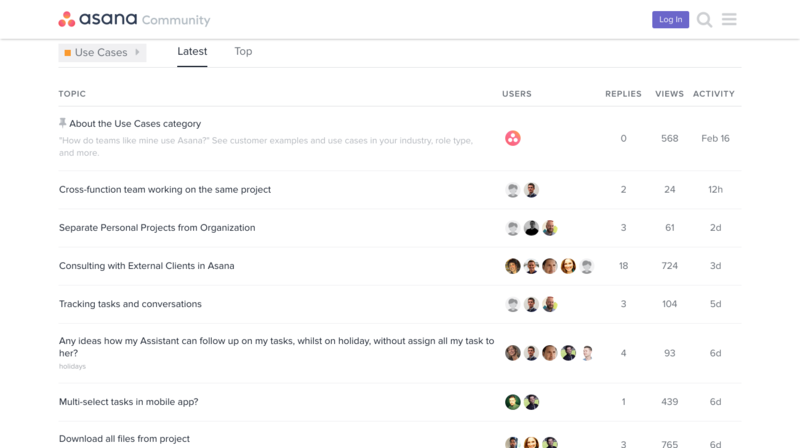 Join the Asana Forum to see workflows built by other Asana users. How can I get personalized training on how to use Asana? 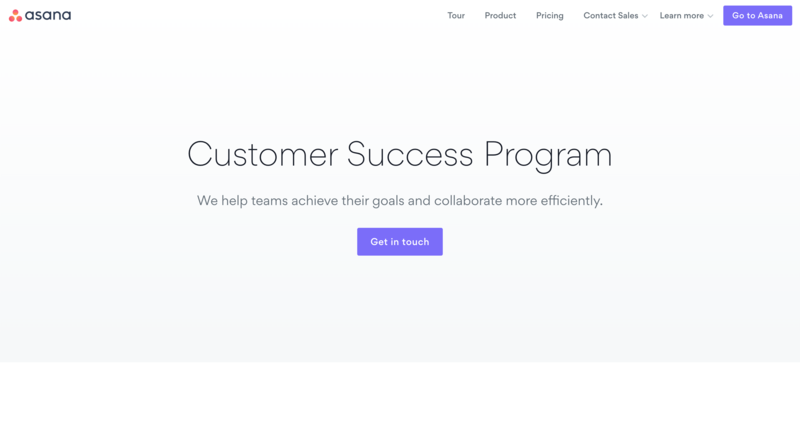 Our Customer Success Managers are here to help! 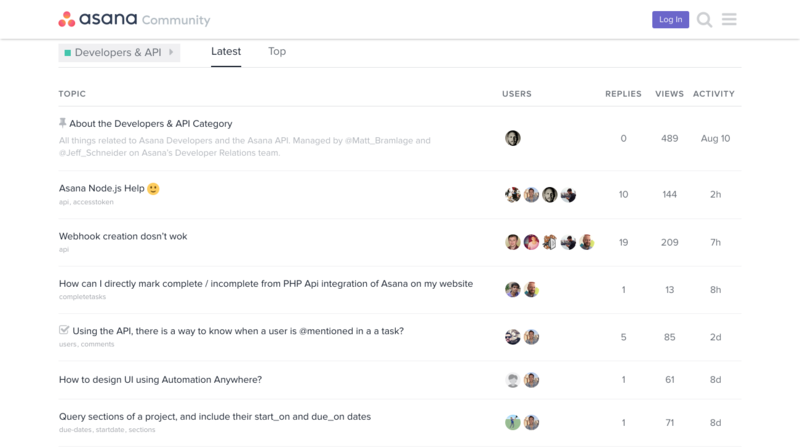 Find out how to engage with Asana’s CSMs by following the link below. Do you host live training webinars? Yes! Our premium subscribers are eligible to attend a live training webinar hosted by one of our Customer Success Managers. Follow the link to register for a live webinar today! How do I learn the best ways to use Asana? 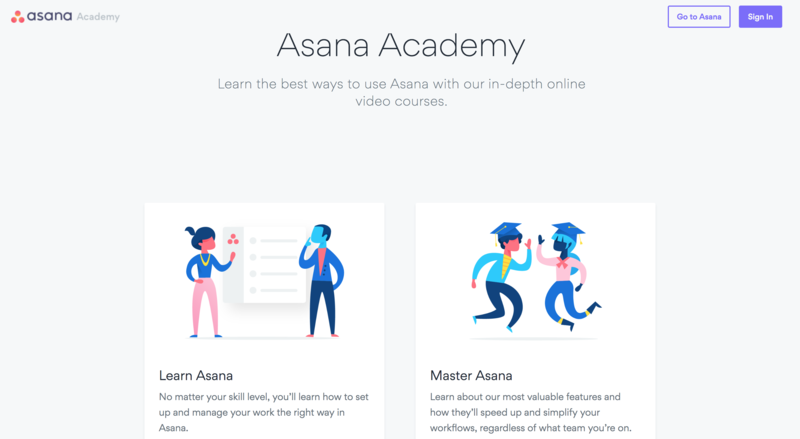 Take our self paced online video courses at the Asana Academy! What are some neat Asana tips & tricks? Check out the following resources written by Asana experts. What are some ways to use Asana? 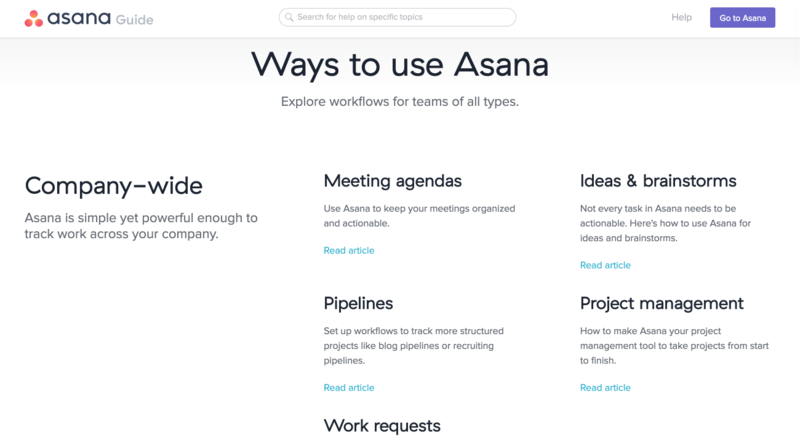 Check out the following examples on different ways to use Asana. How do I submit feedback about Asana? Does Asana make you smile or scratch your head? We’d really love to know your thoughts. If you have any feedback for us, post your thoughts on the Forum! How do I submit an Asana feature request? Have an idea that could help us improve Asana? Post your request on the Forum! How do I find a list of tags in my Workspace/Organization? 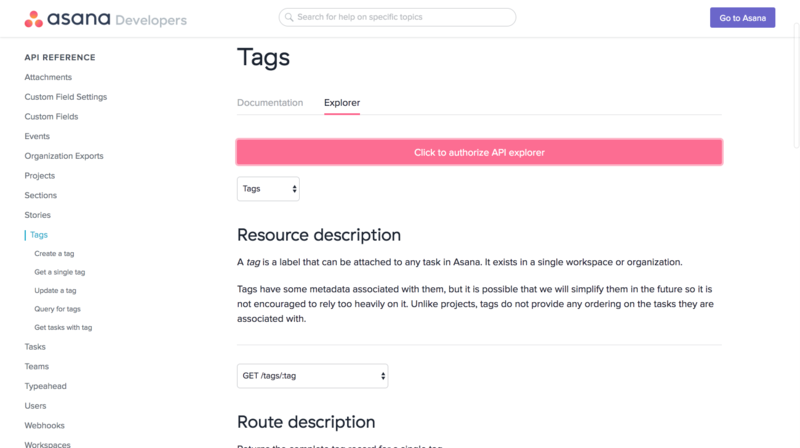 Tags list is no longer available in Asana, but you can pull a list of your tags with our API. Try it out by using our API Explorer. How do I make subtasks appear on my project calendar? Subtasks do not inherit the project association of its parent task. A subtask will only appear in a Calendar if the subtask is explicitly added to the project. Once the subtask is added to the project, it will appear in the Calendar View. Help is on the way! We just need to check your account to send you to the right place. If you are seeing a blank screen, missing buttons, or encountering any other strange app behavior, please try clearing your browsers cache, cookies, or history—or upgrade to the newest version of a supported browser. If Asana crashes and you see a unique error phrase, be sure to note it down and let us know. If possible, please also provide screenshots or steps to reproduce your issue. How do I request a password reset link? If you don’t remember your password (or need to change it) click Forgot your password? on the login page, or reset your password here. Check your Spam folder to ensure that the password reset link was not accidentally filtered there. If you still cannot find the link, contact our support team below. For security reasons, our password reset links expire after a few hours of the initial request. If you’ve exceeded this time limit, try requesting another link here. If you are still having problems, contact our support team below. You received this email because you were a Member of an Organization and were recently removed from the Organization, which in turn removed the company email address from your account. In free Organizations, all Members have the ability to remove other Members. In premium Organizations, the only the administrator can remove Members. If you feel this was done by mistake, just ask someone still in the Organization to invite you back in. There are two likely scenarios. (1) You used Google login with an email address that had no Asana account, or (2) you have an account under one email address but were invited into Asana under another email address. If either of these are the case, just go through the account creation process and once you enter Asana, merge your two accounts together to resolve this issue. Only the current billing owner can reassign this role to another person. 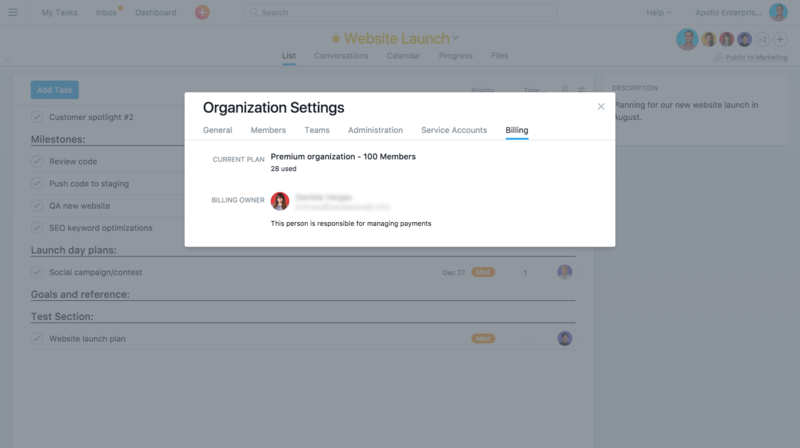 This can be done from the Billing tab of the Organization’s Settings. If your billing owner is not available to make this change, please contact our support team below. Only a current administrator can reassign this role to another person. This can be done from the Admin tab of the Organization’s Settings. If your administrator is not available to make this change, please contact our support team below. The billing owner of your account can find the last invoice via the Billing tab of the Workspace or Organization’s Settings. Alternatively, you can locate any Asana invoice email and click the Billing Account Details link near the bottom of the message. This will take you to an external page where you can download any or all of your past invoices. If you’re having issues with our mobile app, try uninstalling and reinstalling the app to see if that solves your problem. If you’re still experiencing issues after reinstalling the app, contact our Support Team to troubleshoot further. 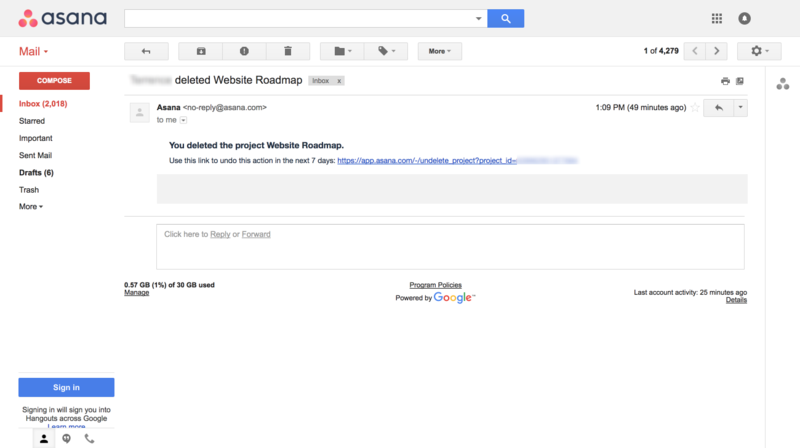 The person who deleted the project should have received an email containing the Project ID along with instructions to recover it automatically. You can recover deleted tasks and from the Deleted Items View found in the sidebar. Add your new email address to your account, then let our support team know what your new email domain is and we can help you associate it to your Organization in Asana. 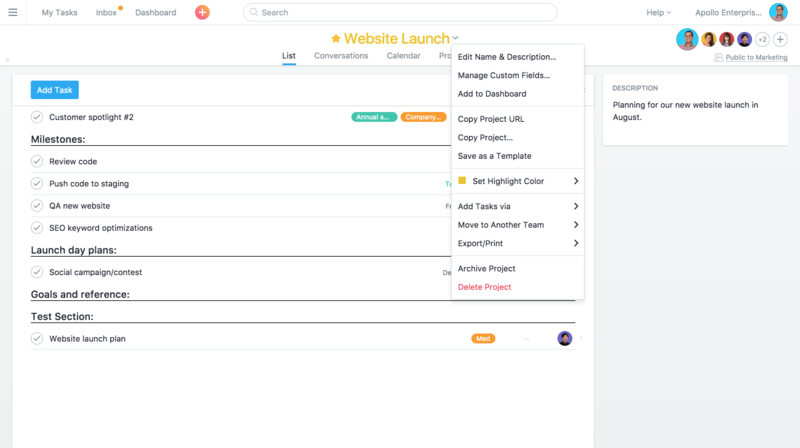 Go beyond to-do lists and get the features you need to plan and manage projects — from start to finish. Upgrading is simple, self-service, and only takes a few minutes. 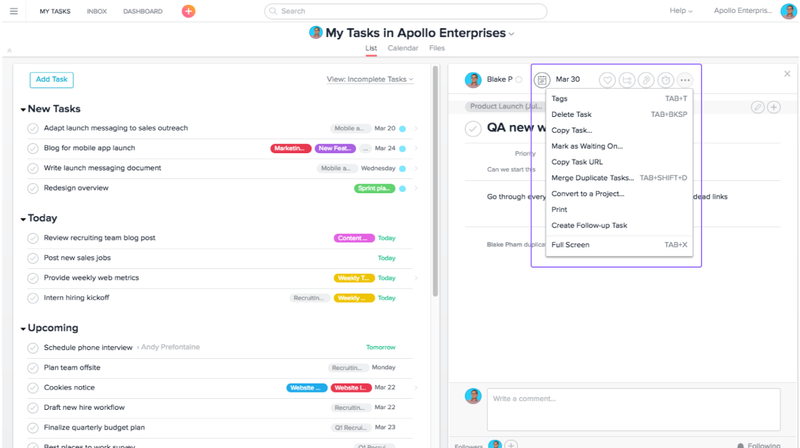 Your mission control for work happening across projects, teams, and even your entire company. Enterprise gives you more control and support. 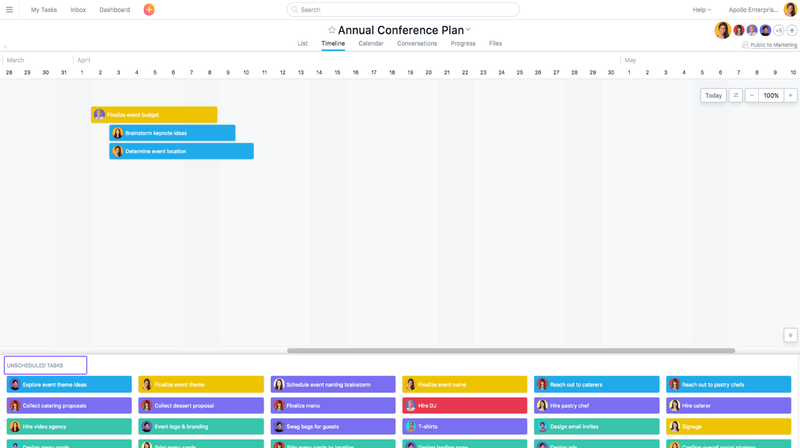 Perfect for Organizations that are larger or want a custom Asana experience.